Great post Lars! Ive been very enthusiastic regarding DIVISIA measures since reading Ireland/Belongia paper on money/interest relation to real variables (recommended by D.Beckworth in one post). This looks like a good story for the UK! There are no DIVISIA indexes for Euro area yet? Thanks Petar. I am told that the ECB actually has an internal Divisia series, which it for some reason so far has refused to published. The Duncan Brown results are interesting. However, I caution him that Granger causality tests should always be done on level data otherwise the results will be inconsistent. This is discussed in detail by James Hamilton in “Time Series” on pages 651-3. In particular, all of my Granger causality tests are done in levels using a VAR technique developed by Toda and Yamamato that addresses the issue of nonstationarity by adding additional lagged terms as exogenous variables. I’ve conducted Granger causality tests on the US and found bidirectional Granger causality between the monetary base, M1, M2, MZM and NGDP on quarterly data since 1959 all at the 1% significance level. A couple of weeks ago I expanded my Granger causality tests to more thoroughly cover five zero lower bound episodes when the monetary base was significantly expanded (i.e. when there was QE): 1) US from May 1933 to February 1937, 2) US from July 1937 through November 1941, 3) Japan from March 2001 through May 2006 4) the US from December 2008 through September 2012 and 5) the UK from April 2009 through September 2013. Note that since Japan only started QE in earnest in April 2013 I have not included this episode yet because the period is too brief. The time periods were selected based on the level of interest rates. The US periods in the 1930s are when the 3-month T-Bill yield was 0.29% or less. The Japanese period was selected based on when the call rate was 0.1% or less. The most recent US episode is when the federal funds rate dropped below 0.25%. The UK period was selected based on when the bank rate was 0.5% or less. All of the results were interesting, particularly the US results, but I’ll only report my UK results here as they are most relevant. The UK’s measure of broad money is denoted M4. In addition the BOE also estimates M1, M2 and M3 measures according to Euro Area standards. The lending counterpart of M4 is denoted M4Lx. In addition I ran tests on Retail M4 (retail deposits only), M4ex (without other financial corporations) and the lending counterpart of M4ex which is M4xex. I find Retail M4 Granger causes M4lx at the 10% significance level, M1 Granger causes M4Lx at the 10% significance level, M4 Granger causes M4Lxex at the 10% significance level and M4Lxex Granger causes M4ex at the 5% significance level. The first three results run counter to Accomodative Endogeneity. The monetary base Granger causes 5-year inflation expectations as measured by inflation-linked gilts at the 1% significance level. The monetary base Granger causes the real effective exchange rate of the pound sterling and the industrial production index at the 5% significance level. The monetary base Granger causes the deposit component of the Euro Area measures of broad money at the 10% significance level. In addition the deposit component of M4 Granger causes the monetary base at the 10% significance level. I evidently need to look at Divisia measures next. Thanks Mark…that is extremely helpful. I need to convince you to write a guest post on your results! Mark: the VARs were done in levels form, of the log of the money/credit aggregate along with the log of nominal GDP (all the data go from Q1 1977 to Q2 2013). As you’re a more discerning customer, I had a go at a T-Y procedure and get fairly similar results. 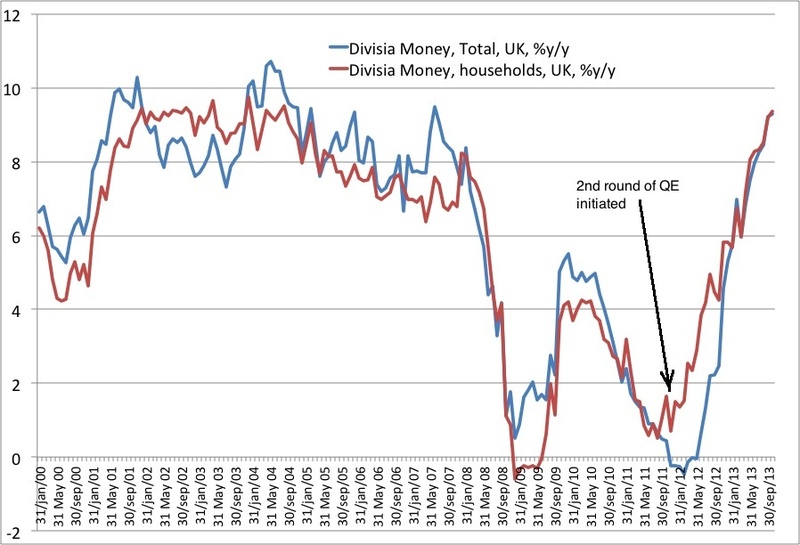 The money > spending causation remains 1% significant for both of the Divisia indices, while M4 households and corporates and both M4L indices all now show causation running spending > money. So Divisia holds up pretty well, regardless. In terms of accommodative endogeneity, Divisia Granger causes M4L (and not vice versa) at the 1% significance level, but most other measures are (as you would expect) much messier. Lars: great post, especially the chart with the timings of policy moves, and thank you for noticing my own post too. Re the decline in time deposits, it is worth noting that the rate paid on such deposits fell significantly over roughly the same period as the decline in holdings shown in your graph. “Multilateral Aggregation-Theoretic Monetary Aggregation over Heterogeneous Countries,” Journal of Econometrics, vol 136, no 2, February 2007, pp 457-482. The ECB makes that data available to its Governing Council, when it meets. I don’t know why they do not make the data public. Sadly the ECB is not the only central bank that does that. For example, the Bank of Japan was one of the first central banks to adopt Divisia monetary aggregates, shortly after I spoke at a conference in Tokyo long ago. I have never seen that data. The only reason I know about it is because they hired Allan Meltzer as a consultant to help them with it. 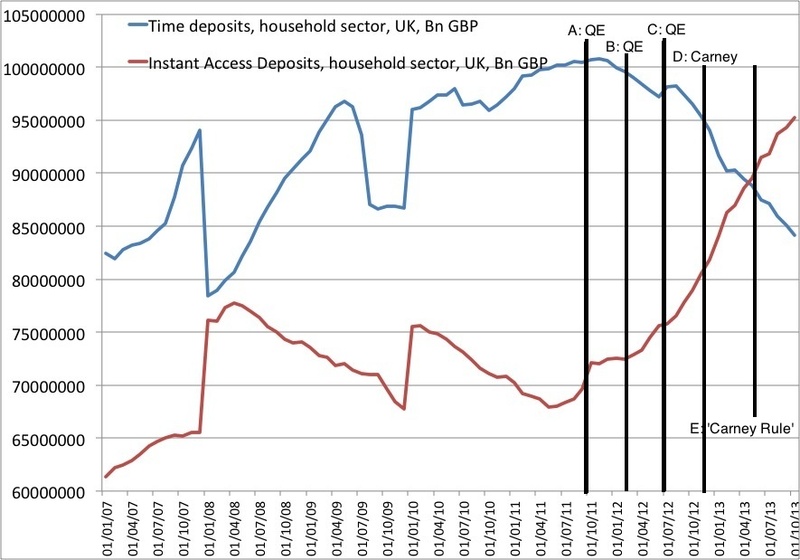 “UK households are reducing precautionary cash holdings (in long-term time deposits) because they no longer fear a deflationary scenario for the British economy”. If by “deflationary scenario” you mean a falling price level, did UK households ever fear a deflationary scenario for the British economy ? Page 35 of the latest Bank of England inflation report ( ttp://www.bankofengland.co.uk/publications/Documents/inflationreport/2013/ir13nov.pdf) in fact suggests households’ inflation expectations have fallen between 2011 and now. Sorry, meant Page 34 ! I’ve only encountered Divisia in passing but this has inspired me to read Barnett’s book (along with a guest appearance from The Godfather himself!). However, I think there’s something a bit counterintuitive here. I generally think of money demand as increasing when people shift from less liquid assets (stocks, bonds) to more liquid (deposits). Here we see the opposite – people going from less liquid to more liquid but the demand for money DECREASING. Perhaps this is just a flaw in my prior framework, or an advantage of the Divisia framework that it shows more clearly changes in precautionary and transaction demand. A lot to think about here. An anecdote from our household. We were not convinced that the financial system was going to survive during 2009. We feared the introduction of depositor confiscation (“bail-ins”, or “Cyprussing” as I now call it). We feared that one day we might be told that our money in the banking system was still there, and still ours, but we wouldn’t be allowed to withdraw it. We tried withdrawing cash but met with stiff resistance and some very hostile questioning from the banks and building societies. It was quite remarkable how the attempted withdrawal in cash of amounts such as £5,000 during 2009 was met with reticence, evasion, and delay, This made us even more fearful. Our reaction was to cease paying cash into the bank from our cash-generative business. We used funds from maturing term deposits to cover cheques to buy the cash from our business, obviously accounting for these transactions properly. We accumulated £30,000 in cash from this, all in small denomination banknotes which we stored in a safe place. During 2011 and 2012 we decided to invest this cash but because of anti-money laundering rules we had to move it back into the banking system first. I wonder whether others were behaving similarly during this period? Our current behaviour is a determined effort to get rid of all our cash and all deposits in the financial system. We have a line of credit in the form of a partly used offset mortgage and we can draw on the balance at any time so this gives us a “buffer” if we get our sums wrong and take a bit too much out at any time. We have nearly completed the closure of all our savings accounts (except for an allegedly inflation-proof NS&I bond). The money is now invested in a spread of assets which we think will survive a period of rapid reduction in the purchasing power of paper money, and a temporary seizure of the UK financial system. Our current tax position means that we are not motivated to chase yield like so many and therefore our primary objective is capital protection. We have been very influenced by Mark Carney’s track record in Canada and we did quite a bit of research into what he did there and what the results were. Of great interest to us is our observation that all the people we know, without any exceptions whatsoever, are either wealthy (and nearly all of those are of similar mature age to ourselves) or living payday to payday with negligible net liquidity. We don’t know any households who we could call examples of the traditional “middle class” with a regular surplus of income who are willing and able to save money in the traditional way over and above their pension contributions. Not one. As I said, just an anecdote from one household. Ravi: I am not sure that I understand your hypothesis, and I am not an expert on the British economy. But, yes, a transfer of funds from less liquid assets to more liquid assets would increase the monetary service flow and thereby the broad Divisia monetary aggregate — if all else is constant, including all interest rates, prices, and total portfolio expenditure. Of course one would then be left with the problem of explaining the transfer, when all relevant explanatory variables had not changed. For example, if the substitution occurred as a result of a Hicksian compensated change in relative interest rates, then monetary services and thereby the Divisia monetary aggregate would be constant. In short, your question is more complicated than it might have appeared to be. Most misunderstandings about the Divisia monetary aggregates result from falling into the trap of one of the well-known paradoxes in microeconomic theory, such as the famous “diamonds versus water paradox.” I hope that your question will motivate you to learn the relevant theory, so you will be able to answer such questions on your own.